I came back from Akademy last week and would love to share my experience with you all 🙂 This year also Akademy was great with lots of fun, shared/gained information, met old friends and made some new. This year, pre-registration was at the shiny new Red Hat office in Brno on 5th September. 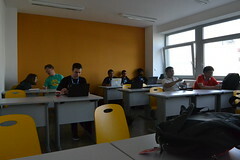 Most of my friends whom I know and going to attend Akademy were present there. It was very pleasant and happy feeling to meet everyone after an year. 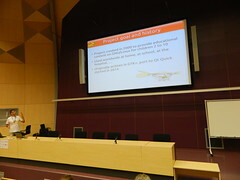 Akademy was two days of main conference which were on 6th and 7th september. This year our keynotes speakers were Sascha Meinrath and Cornelius Schumacher . Bruno Coudoin talked about how and why GCompris moved to QtQuick with the support of KDE. What all challenges project faced while moving from GTK to Qt. 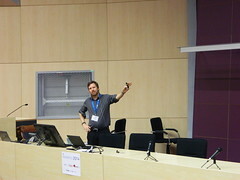 Martin Gräßlin gave an overview of current state of Kwin in adding Wayland support and future plans. Kevin Ottens talked about KDE craftsmen where analysis was on the way we handle our software production, how can we make our software even better. Kai Uwe Broulik talked about current status of Qt port on Android and iOS. Currently, 3 iOS apps in Apple store and 8 Android apps in Google play since December 2013.
gcc options like -g[0-3] to add level of debug information into binaries which can be further used to solve program issues using tools like gdb. I loved attending workshop on visual design and QML by Andrew Lake . I have already seen awesome mockup design which Andrew created for Plasma Media Center. It was fun to be in his workshop and learning the way mockups can be created using QML. You can also try that by following this wiki. I say “send email” and kmail opens mail compose for me, interesting right? This is what Peter Grasch did in speech recognition workshop. He showed how easily you can configure rules in simon to make your application voice controlled. BoF is one of the the main part of every Akademy which continues for 5 days after main conference gets over. Anything which needs discussion, help or feedback gets sorted out by scheduling a BoF for that particular topic. Vision of Plasma Media Center which we finalized to “To offer an immersive, rich and easy-to-use media experience crafted by KDE for you”. Repository structure i.e whether to split PMC into libs and backends as two separate repository or keep it in same repo. Finally, we agreed on keeping into single repository. KDE Edu use in India : This BoF was about FOSS community in Hyderabad, India which have started to use KDE Edu apps for teaching children in government schools with the help of ThoughtWorks. They are creating an interesting app called Human-atlas which will help children to learn about body parts in interesting way and can take Quiz to test what they already know. KDE India Future Plans: This BoF was to give an overview of what all KDE events happened in India, what problems organizers faced, what all fruitful results came out of various events. Suggestions on how we can improve to attract more people to attend conference and bringing them to FOSS world. KDE Windows: This BoF was for asking questions and help regarding KDE on windows. I attended this because I was curious to know what all KDE apps work on KDE windows and if Plasma Media Center could be run on windows. 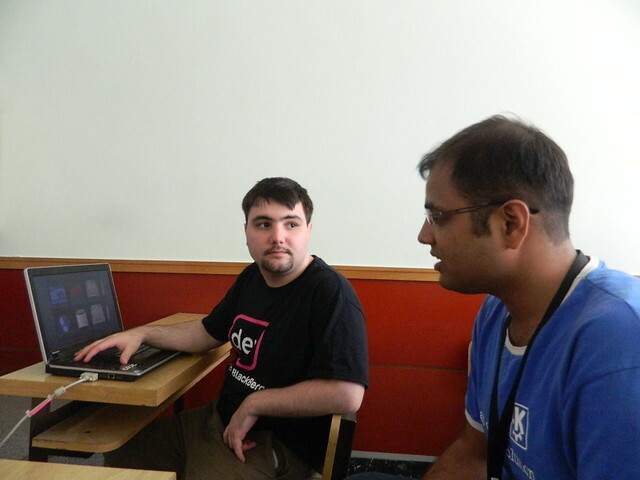 It was great to see efforts KDE Windows team have done to compile various KF5 modules. Kudos to them from my side! Being around with KDE people is always fun. I also find fun in collecting different FOSS related goodies. Oh, yes! 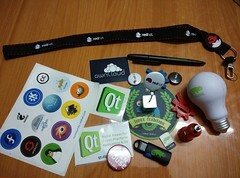 This year too I collected some of them from different sponsors booth including Red Hat. Akademy day trip is always fun intended. This year we went to see Brno Reservoir. We explored surrounding for sometime and further we went for Ferry ride which was amazing. 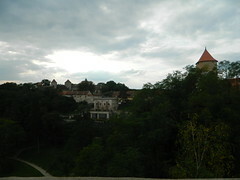 Through Ferry, we reached to Veveří Castle . After seeing castle, to re-energize we took some rest and light snack/drink. After that we returned back to reservoir via bus and further headed to restaurant for dinner. While writing this blog, I felt like I revisited Akademy. These are awesome moments which will get remembered throughout life. You can find some awesome pictures taken during Akademy here . Thanks to KDE eV for sponsoring my travel and accommodation. Also many thanks to all sponsors and volunteers with the help of which this year also Akademy was superb. Akademy is one of the awesome conference which I always love to attend. This year, it will take place in Brno, Czech Republic from 6th to 12th of September. Schedule for conference is already available, which consists of 2 days of talks followed by workshops and BoFs. Similar to previous years Akademy, I am pretty sure it will be rocking this year as well. It gives us chance to meet lots of kool, awesome, geeky, friendly and lovely people. You will find folks from different countries from all over continents with experience in different areas like development, usability, testing, user interface, marketing and yes users who love using KDE. Akademy is always very useful for Plasma Media Center project as we organize BoF and discuss about project status, take feedback and discuss about its future. This year also, we have scheduled PMC BoF on 9th September. Usability discussion thread for PMC next UI is already in progress on KDE usability forum . Be there for BoF, if you have feedback and want to help us in making Plasma Media Center more awesome and reachable to more larger mass. Looking forward to meet you all awesome people during Akademy! 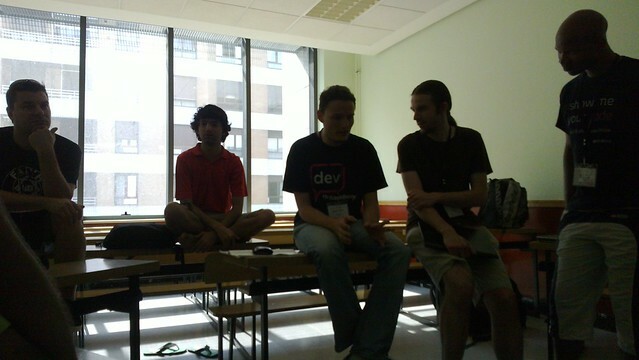 Birds of a Feather sessions (BoFs) are one of the most important events at Akademy. Just like every year, there were BoFs related to different projects. These BoFs are a good way to get live feedback from other people in community. This BoF was organized by Björn Balazs and Jos Poortvliet. – For this BoF developers volunteered for having usability test of their projects. – Members of KScreen, plasma-nm, Plasma Media Center and KStars project participated in it. After doing usability test of Plasma media Center, we got some important feedback in which we already implemented few and will implement rest soon. – It aims to share experiences, discuss how to improve the mentoring programs, and talk about any questions come up. – Participants introduced themselves what they have done in past related to mentoring program. – Most of the people first participated as student and later became mentor of these mentoring programs. – We also discussed some of the issues which mentors faced while selecting students in mentoring programs and how to improve mentoring programs. – Main aim of this BoF was to discuss future plans and implementation details for some of the features in PMC. – Other than fixing UI issues, Vishesh Handa from the Nepomuk project pointed out that users should be able to add their media collection to the nepomuk index straight from PMC without needing to go to System Settings. – Compare to last year BoF, this year we got good feedback for improvements we achieved in PMC. Thanks to all PMC contributors for their hard work and love for this project. Being a part of KDE Akademy is one of the most awesome experiences ever. This was my second Akademy after the one in 2012 . Akademy 2013 was held in the beautiful city of Bilbao in Spain. Held from 13th July to 19 July, it had 2 days conference followed by 5 days of workshop, Birds of a Feather sessions (BoFs), lots of hacking, and of course lots of fun! I reached Bilbao on 12th July and went for pre-registration where I also met many KDE folks (some of them I already met during last Akademy and some new people). It was great to meet everyone again, we all had a fun time together with greeting each other, drinks and lovely music. The first day of the conference started with a keynote by Eva Galperin . A member of EFF, she talked about the NSA surveillance and how it affects people outside the US. After keynote, Kevin Krammer gave talk on Declarative widgets where he explained and showed demo on how to create widgets based UI in QML. This approach enables non-C++ programmers to participate in UI development for traditional desktop applications. Till Adam talked about KDE on Blackberry where he explained about Blackberry 10 architecture which is totally based on Qt with QNX kernel and discussed why KDE should be interested in another mobile platform. We got a chance to hear the story about the Mer Project and the current status by David Greaves. Mer is used by Jolla for the Sailfish operating system and Plasma Active as the base distribution for creating tablet systems. He talked about how the Sailfish SDK uses virtual machines for even the SDK (apart from the simulator) as it makes it easier to run the SDK on different platforms. 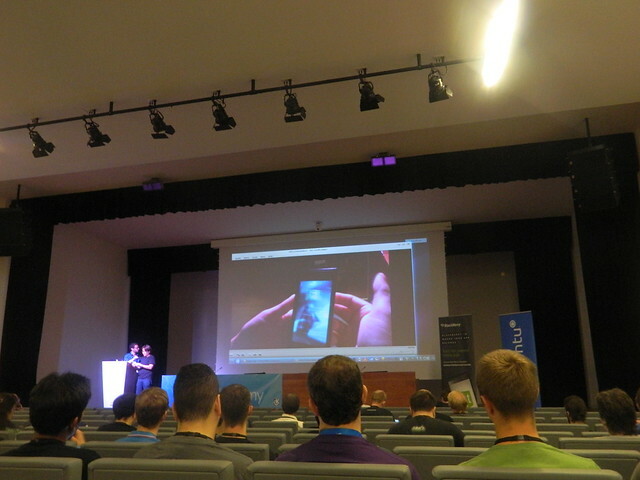 I always wanted to see a live demo of the Jolla Phone, based on Sailfish OS, and I got lucky! Along with a beautiful demo of the phone, Vesa-Matti Hartikainen from Jolla talked about the history behind it, how Jolla’s team collaborates with various open source projects such as Qt, Mer, and Nemo Mobile to build the system. Further Will Stephenson talked about LightWeight KDE which try to exploit KDE’s modularity and tweakability by cutting down a full feature desktop to the lightweight desktop size, while retaining the ability to use additional components from the full feature set as needed. This time we had a new guest at Akademy, the Razor Project. 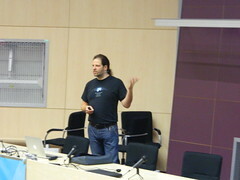 Jerome Leclanche talked about the effort towards a lightweight, modular, Qt-based desktop. He discussed how Razor project collaborates with other desktop environments and various efforts towards compatibility with KDE Frameworks. And if this was not enough, he pointed out that even LXDE is moving to Qt (yay!). I think this is probably one of the coolest things about the Free Software communities, that even projects that are technically competitors actually collaborate with each other. Marco Martin talked about Plasma 2 where he talked about changes in the Plasma library from Plasma 1 to Plasma 2, how to use it from any application, and how a single workspace will now be used for all form factors, such as Plasma Desktop, Netbook and Active. We are planning to move Plasma Media Center too from Plasma 1 to Plasma 2 (and hence, to Qt5) once the libraries are stable enough. Later, Shantanu Tushar gave talk on “Pair Programming”. He shared his experience on benefits of doing pair programming and how did in KDE projects like Calligra and Plasma Media Center with me, Sujith and Akshay. 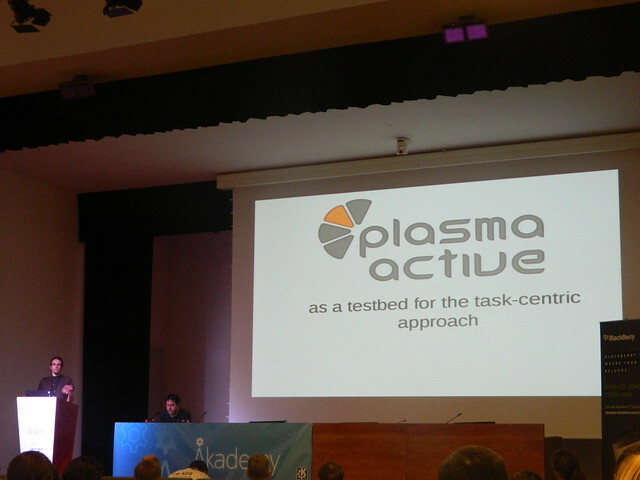 At the end of the day, Thomas Pfeiffer and Björn Balazs gave a talk together on Task-Centered UIs in Plasma Active . Plasma Active is one of the best example I know which is a tightly integrated system combining various components into it. UI workflow is in such a way that optimal user intervention is required while achieving required task. 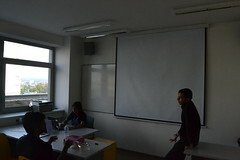 Similar to last year, there were Lightning Talks by students. It was interesting to see that this year students were from GSoC as well as other mentoring programs like SoK, Google Code-in, OPFW. Students were from different KDE project like Telepathy, KDE connect, Keyboard layout, Digikam, Tomahawk. It was good to see the progress and experience of students while working on KDE projects. Lydia Pintscher talked about Negotiation Theory for geeks. It was about conflicts which arise in free software projects and techniques to resolve them. After lunch, Kevin Ottens gave Keynote on KDE Democracy where he looked upon the democratic and meritocratic structure of communities and how KDE has changed over the past few years. Later, Vishesh Handa and Martin Klapetek gave talk on Metacontacts Library which aims towards a system to aggregate all multiple contact sources into a manageable way. This is done by keeping all information in Nepomuk and providing library to developers called KPeople. Simon is KDE’s speech recognition system which is maintained by Peter Grasch who gave an interesting talk on FLOSS Speech Recognition. He explained current status of this project and also gave demo on how nicely speech recognition works. 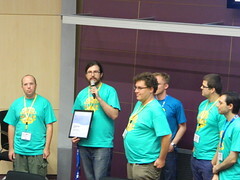 At the end of conference, there were short presentations by various sponsors of Akademy like Blue Systems, BlackBerry, Red Hat etc. I had a great time during Akademy by meeting old friends again, making new friends, learning new stuff and lots of fun 😀 Thanks to my employer, RedHat for sponsoring my travel and KDE eV for taking care of my accommodation. Various small improvements have been done according to suggestion from Akademy 2012 PMC BoF and new features has been added. 2. Add media to Playlist. This option is obtained by holding mouse on media for small time. 3. Cover fetching of available music files. I am so happy that we got a new contributor for PMC, Fabian Riethmayer . I hope, more people will join and contribute in PMC by giving suggestion, feedback, code etc. Thanks to all and Cheers! Next day, we had keynote, talks and GSoC student lightning talks. Even I gave a lightning talk on Plasma Media Center (PMC) which included brief overview of PMC features and future work. Thanks to Lydia and fellow contributors who helped me in giving the presentation. Looking forward to implement all the suggestions I got provided. I have updated the summary of PMC BoF on wiki page too. I still need more feedback and suggestion. Your suggestion will lead PMC to perfection and more usable by common people. So, if you have any kind of suggestion related to PMC , put it here. I will be the most happiest person to implement it. I am so happy and excited since this is the first time I am going to Akademy. Eager to meet all people from the KDE community, after meeting them for the first time during conf.kde.in . Akademy gives you the chance to get together with all people, share ideas, have fun and lot more. There will be so many talks by different people who will talk about different KDE projects and It will also have BoF and workshop. Anyone who wants to learn QML should attend QtQuick 2 workshop. If anyone is interested and wants to know in detail about any particular project, Birds of a Feather sessions (BoFs) is the right place. If thats not enough for you, there will be hacking room too. This time there will be 2 hours BoF on Plasma Media Center too on thursday. I know many people are interested in this project and wanted to help in its development by code or feedback. So, please come to the BoF of PMC and see live demo. We need YOU!